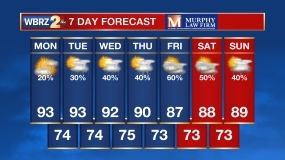 Things are getting active on Hawaii’s main island. Kilauea, the world’s longest-erupting volcano, is opening up a new vent and rocking the surrounding community. Lava has been actively spilling out of Pu’u ‘O’o crater since 1983, but now the crater is empty. The lava that was there has been diverted 10 miles away, breaking ground in the Leilani Estates Neighborhood. It’s not just the lava, but these cracks are also releasing massive amounts toxic Sulfur Dioxide into the air. This is causing evacuations for several communities along the East Rift Zone, as fissures are breaking through the ground surface and spewing hot magma into the air. The lava is now responsible for destroying at least 35 structures and covering over 75 football fields with molten rock. New fissures continue to break through, as existing ones are widening 1-2 inches a day. Lava breaking through the the new fissure erupting the evening of May 5th, spewing magma up to 230 feet. A panoramic view of fissure 7 from the intersection of Leilani and Makamae Streets in the Leilani Estates subdivision. An eruption in the Leilani Estates subdivision in the lower East Riff Zone of Kilauea Volcano. White, hot vapor and blue fumes emanated from an area of cracking in the eastern part of the subdivision. Concern began over the last month as seismic activity has increased around the area, but things have peaked since April 30th. That is when the crater floor of the Pu’u ‘O’o Crater collapsed and allowed the lava to retreat back into the Earth. 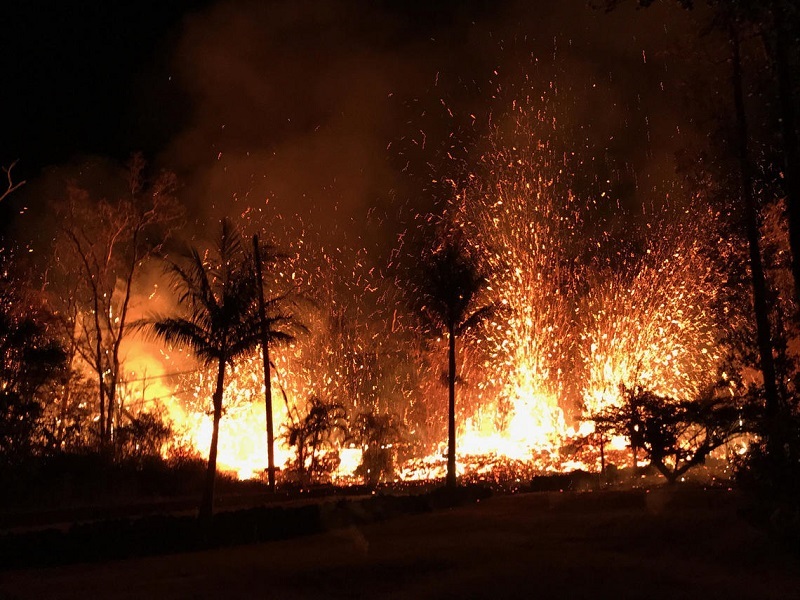 Two days later, an eruption commenced in the Leilani Estates subdivision on the lower East Rift Zone of Kilauea, and the eruption continues. A magnitude 5.0 earthquake shook the ground around the cone of the Pu’u ‘O’o crater. Moments later, a collapse occurred in the crater of, creating a robust, reddish-brown ash plume. Earthquakes and volcanoes are a way of life in Hawaii, and are responsible for the creation of islands over the last 3-4 million years. Earth’s outer crust is made up of a series of tectonic plates that move over the surface of the planet. Volcanoes can form both on the edges of these plates, as well as in the middle of a plate where magma rises upward until it breaks through the ground surface, this is called a “hot spot”. 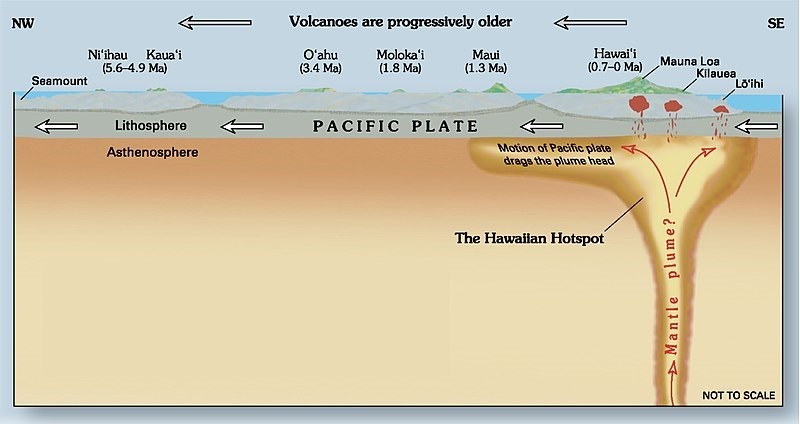 The “hot spot” is fixed, but the Pacific plate moves above it, effectively creating the Hawaiian Island chain. A cross-section of the Hawaiian Hotspot. Hawaii experiences an average of 112 earthquakes yearly, with 11 having a magnitude 4.0 or greater. However, since April 9th there have been over 1,900 earthquakes. 14 of these earthquakes have been a magnitude 4 or higher, with the highest topping out at a 6.9 magnitude. It is likely that the earthquakes and volcanic eruptions are attempting to find a new median, but scientists are not sure how long that will take. The earthquakes are not nearly as strong over the last week, but the volcanic eruptions continue to grow and produce more fissures. These breaks in the crust help to alleviate built up pressures underground, which helps lessen the potential for large earthquakes. 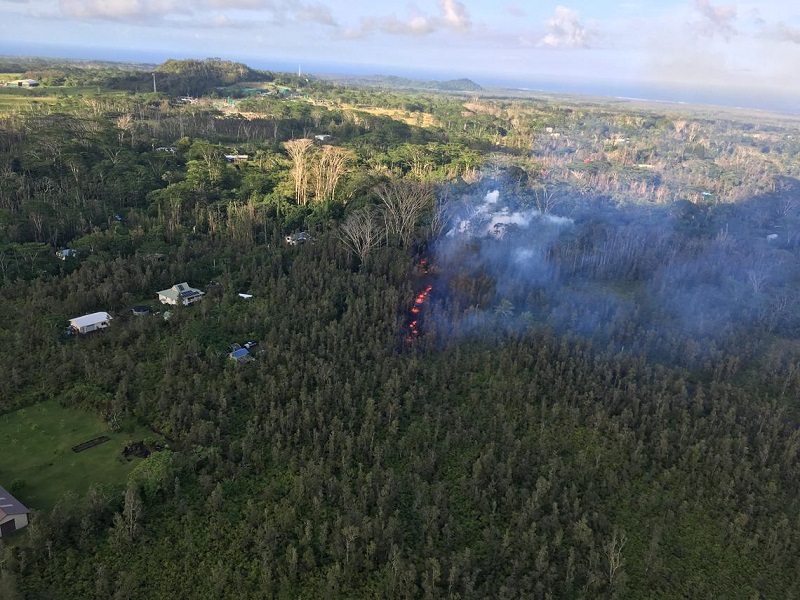 The issue is that this may become a new lava flow, which could mean that the fissures and eruption could last for a considerable amount of time. 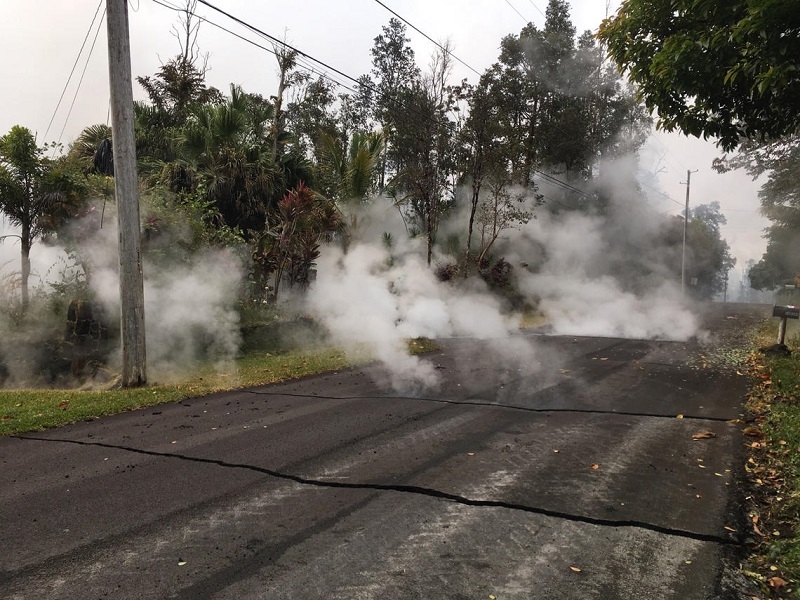 Steam rises from fissure 9 on Moku Street in the Leilani Estates Subdivision. Thermal map shows the flow spreading northward from fissure 8 during an overflight of the area. The black and white area is the extent of the thermal map. Temperature in the thermal image is displayed as gray-scale values, with the brightest pixels indicating the hottest area, as the whitish areas show the active laval flow. The gray linear features are the other fissures that are numbered in red, and have erupted thus far in the sequence. 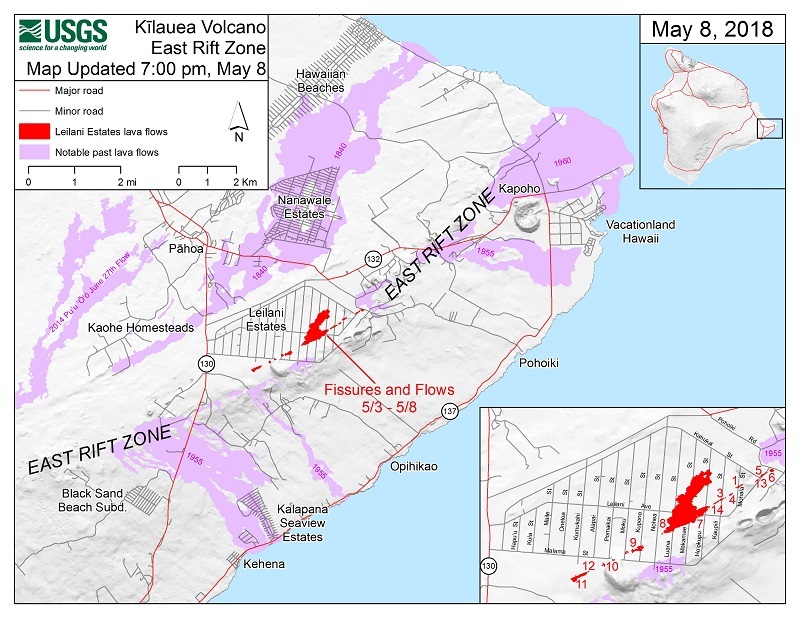 Map of ongoing intrusion and earthquake activity along Kilauea's eastern side. We will continue to update this story as new information becomes available. 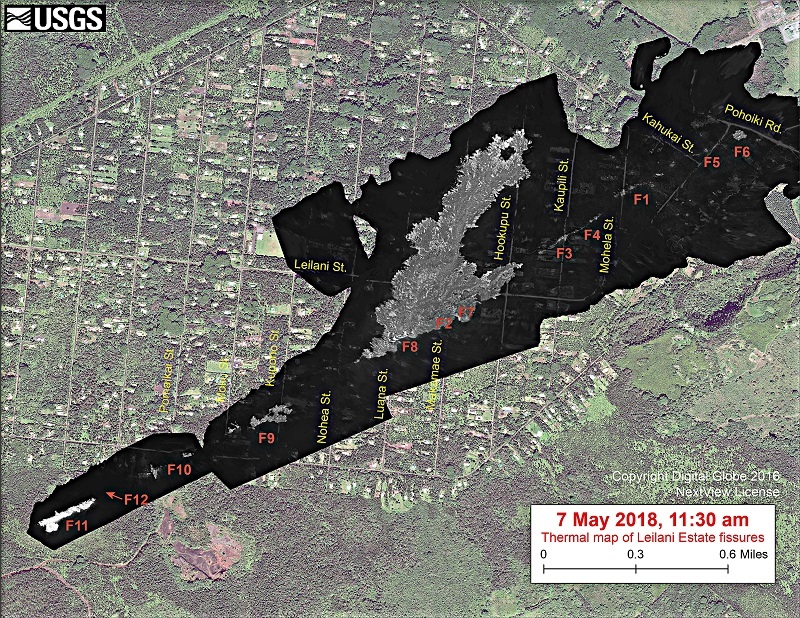 Current Kilauea Hazard maps can be located HERE, as well as in TEXT.